On Wednesday the entire world mourned the passing of astrophysicist Stephen Hawking, including Brazilian soccer superstar Neymar. Unfortunately, Neymar chose to pay tribute to Hawking with a tweet that rubbed a lot of people the wrong way. Hawking, of course, is famous not just for his groundbreaking work in astrophysics, but for the way he helped the general public understand that work with accessible books such as A Brief History of Time. He’s also famous for his incredible battle against amyotrophic lateral sclerosis, or ALS. Whereas most people succumb to the terrible disease within five to 10 years, Hawking managed to live with it for over 50 years, accomplishing some of his most important work while confined to a wheelchair, unable even to speak without the aid of a computer. That brings us to Neymar. 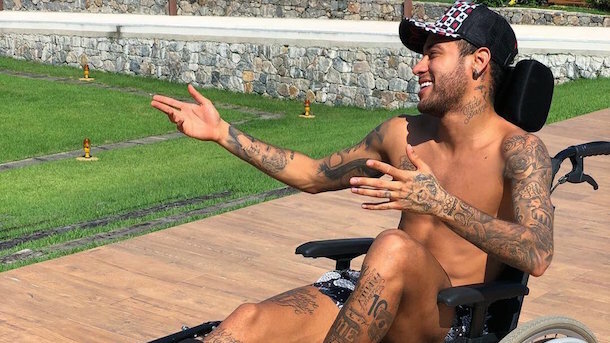 The Paris Saint-Germain striker, who recently broke his foot and will miss the remainder of the club season, apparently sees some similarity between his medical plight and that of Hawking. Because on Wednesday he posted a photo of himself chilling in his wheelchair along with one of Hawking’s many inspirational quotes. “One has to have a positive attitude and must make the best of the situation that one finds oneself in,” the quote reads. It’s a nice thought, but it doesn’t mean as much coming from a guy who makes $30 million a year playing soccer. To be clear, Neymar’s career isn’t over or anything. Doctors expect him to be fully recovered by May. Hawking, by contrast, lived half a century with ALS, a disease that basically traps you in your own crippled body. Everyone: Carragher is football’s idiot of the week. Neymar’s PR people might need to start screening his tweets.